This box contains five holographic polishes, by five different indie makers. A Box, Indied has an extensive list of Indie polish makers that contribute to the subscription box. All of these are different and have varied levels of holo. Some are intense, and some are subtle. But all are holographic. Let's take a look! 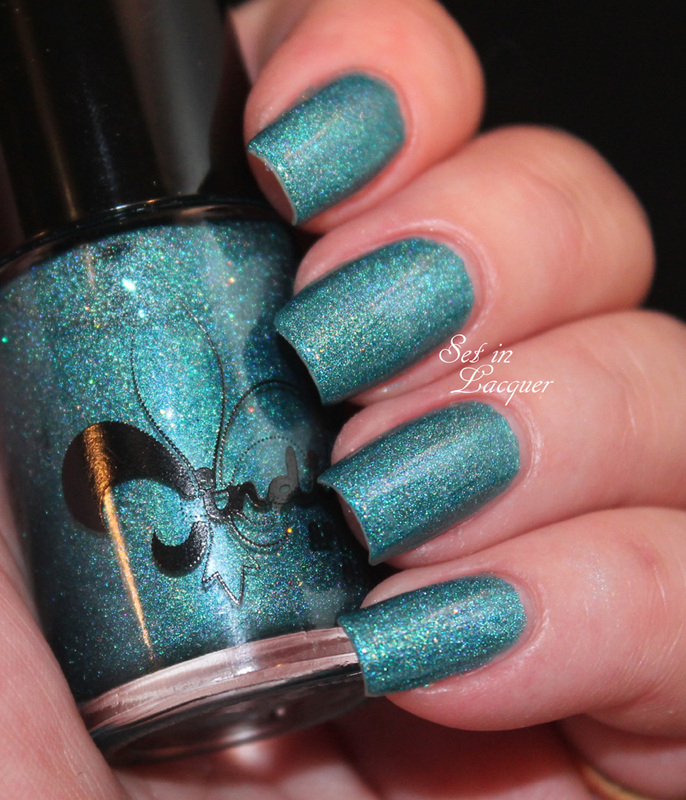 Jindie Nails "Blue and Green's Love Child" is a gorgeous teal with a wonderful holographic sheen. There were no formula issues with this polish. 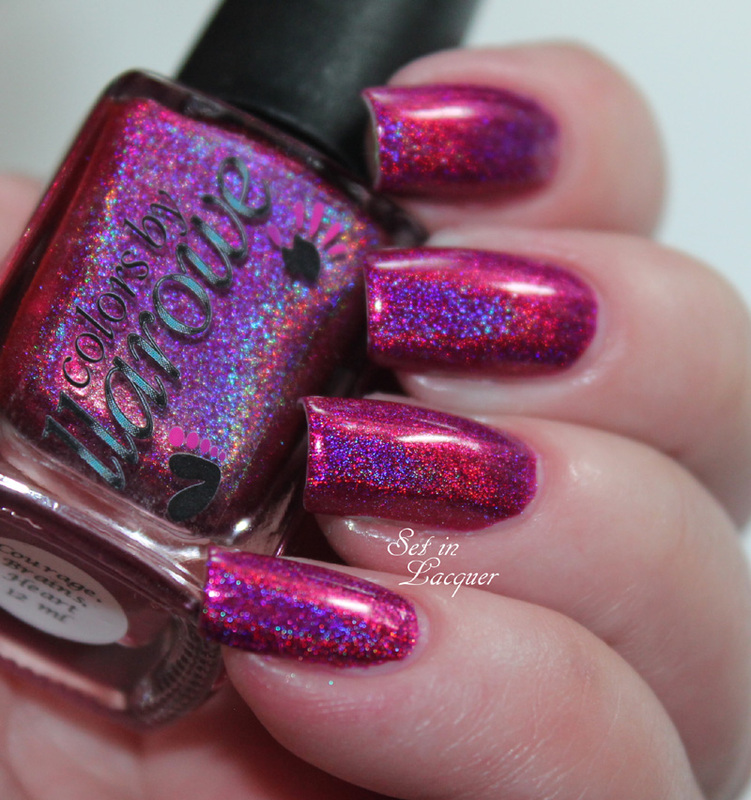 Colors by Llarowe "Courage, Brains, Heart" is a glorious deep magenta pink with a strong linear holographic sheen. There were no formula issues with this polish. 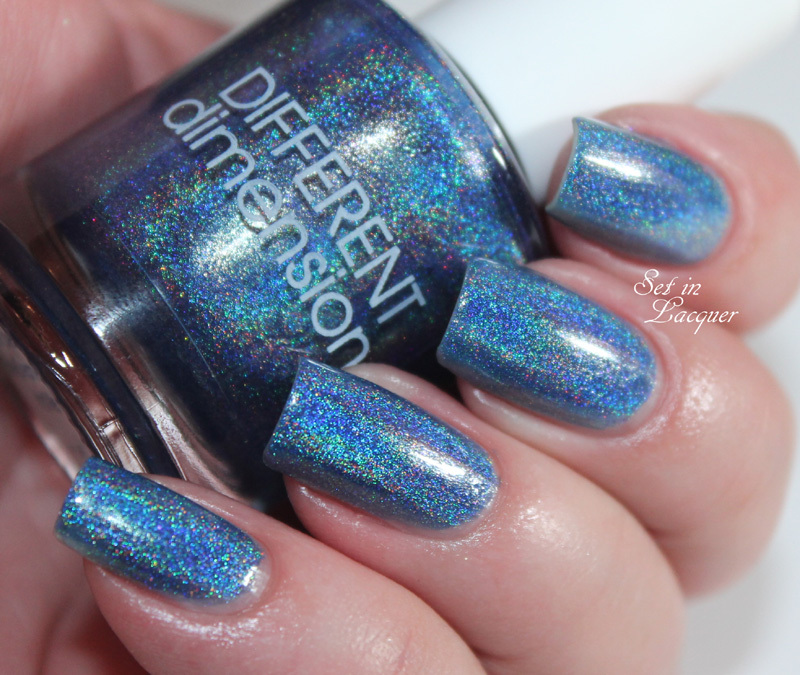 Different Dimenson "The Lovers, The Dreamers, and Me" is a glamorous ocean blue with a strong holo sheen to it. There were no formula issues with this polish. 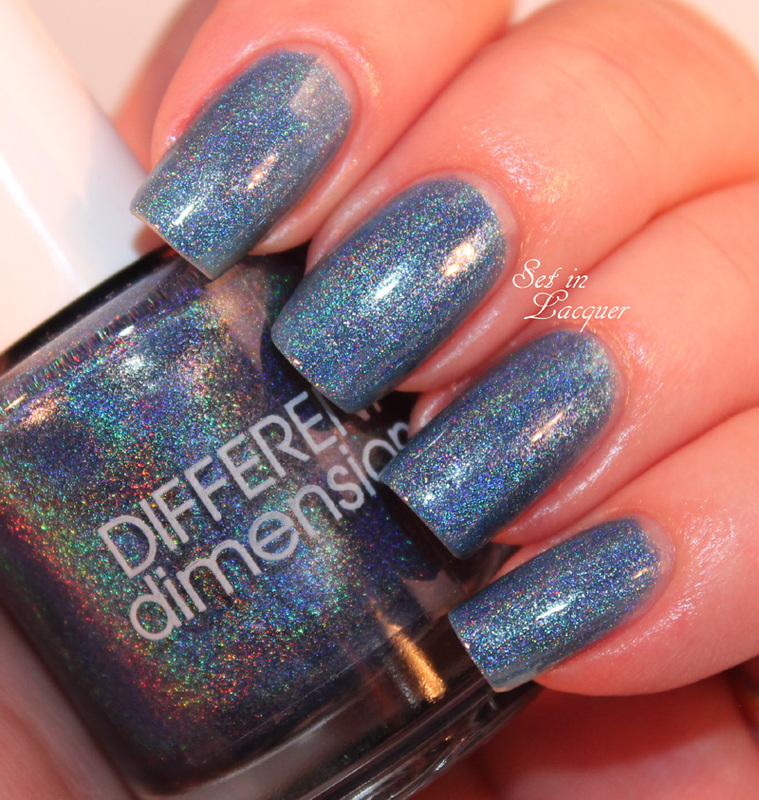 Girly Bits "Perry-Twinkle" is a stunning holographic periwinkle blue. There were no formula issues with this polish. But my camera didn't want to capture the true beauty of it. It is much more vivid in real life. Dollish Polish "Twist of Lime" is a vivid lime green polish with a subtle holo sheen. There did seem to be bits of pigment that had not dissolved. But I managed to work around them. I have a fun glitter topcoat for you today. Jindie Nails - Quit Staring At My Melons is a fun topcoat. It's a party in a bottle. Quit Staring At My Melons - is glitter topper has matte kelly green, barbie pink, matte gray dots, watermelon pink and black dots plus smaller metallic light green and light pink dots. It also has small and extra large matte black dots and small micro hex in matte kelly green, matte gray, barbie pink, black, watermelon pink. The base is a clear base with bits of real silver flakes and intense green shimmer. This color is one of five shades in the Summer Chic Collection. I have it on over Orly Pixy Stix. Jindie Nails is owned and operated by Jen, a thirty something, southern mom with an obsession and love for nail polish and glitter. Jen is the sole proprietor of Jindie Nails and does everything from creating and naming polishes, pouring, labeling, packaging, shipping and much more. Jindie Nails/Jindie LLC started as a hobby in the Spring 2012 and very quickly grew into a successful small business, full time job and way of life for the owner and her family. Jindie Nails Etsy store opened in July of 2012 and by mid-March 2013 there were more than 6,800 sales transactions with 100 percent positive feedback. Jindie Nails polishes are cruelty free, not tested on animals and are 3-free, meaning they do not contain the 3 harmful ingredients commonly found in nail polish: NO Dibutyl Phthalate (DBP), NO Formaldehyde & NO Toluene. This is available from Llarowe so keep your eyes open and your browser pointed to Jindie Nails on Llarowe. Llarowe is a one-stop shopping site for those hard to find indie and international polishes. Make sure to follow Llarowe on Facebook to keep up with the current releases, restocks and new polishes.